We’re almost finished painting the walls for the new Fleet Feet in Myrtle Beach at the Grande Dunes Publix shopping complex. We started by painting the deck with dryfall in the “Black Fox” (SW 7020) color. After that, we did the bare drywall and sprayed a coat of primer before painting. We did a 50% overlap for maximum coverage. They’re using 3 colors for their walls. We started with the Sherwin-Williams SW 6477 “Tidewater” colored walls, which includes the 2 bathrooms. Next, we did the 2 dressing rooms and main walls with the SW 6520 “Honest Blue” colors. Finally, we put on the bold SW 6627 “Emberglow” colored walls. We also painted an area behind where the checkout counter will be in the “Black Fox” SW 7020 color. 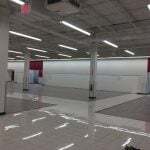 Check out Fleet Feet’s new store opening in early December!